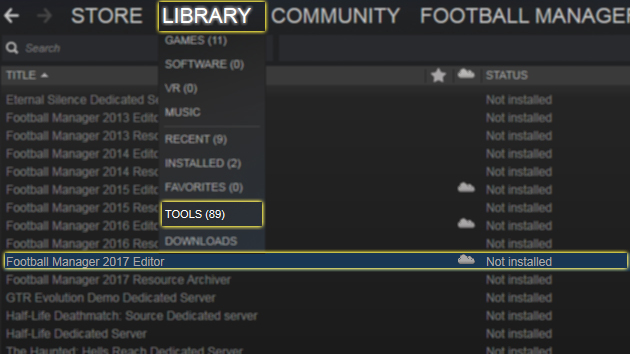 With the release of Football Manager 2017, players also have the option to download and install official pre-game editor from their Steam library. Unlike the in-game editor, pre-game editor is free of purchase. The FM 2017 Editor is a powerful editing tool that allows you to modify the FM17 database. For optimal performance it is recommended that you use the FM2017 Editor on a high-end machine with at least 2GB RAM or more. Due to the massive amount of data stored in the Football Manager database you may experience poor or slow performance on low-end systems. Please make sure you have downloaded Football Manager 2017 before downloading the editor. You need to download it separately through Steam. Once you found it double click and it should bring up a pop-up window for installation. Here you can change the installation path and should it install or not desktop and start menu shortcuts. 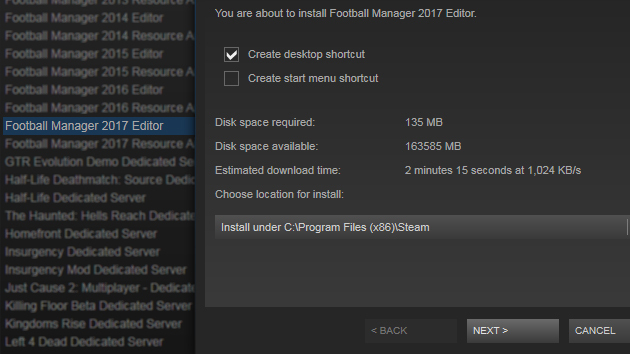 As you can see from the picture below, size of the FM17 editor is 135 MB, make sure you have enough space available at the location where you're about to install the software. Also included are more detailed explanations of the different editor options and how they’re used, which should make the whole experience of using the editor much easier for new and existing users and allow everyone to benefit fully from the Editor’s full power. For those who like to create entirely new teams, we’ve added an option to create random kits. It’s even possible to ‘group select’ clubs and randomise all of their kits at once. Doing this ensures that all of the selected clubs will have different coloured kits with different styles. We’ve also added an ‘undo’ feature, meaning that changes to competition rules can be undone by using a slider to determine how many you’d like to revert, while database changes are now grouped into a single place where they can be removed individually or all at once. 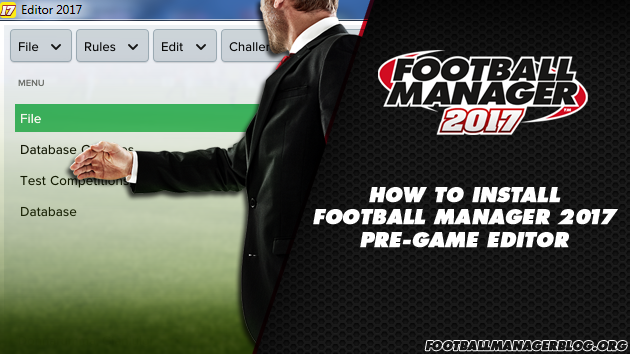 All about Football Manager 2017 pre-game editor, new features and a how to install it on your computer.